If you want to step up your creativity to include embroidery,the new Baby Lock Accord fits the bill. This machine will suit your sensibility for creating even more elegant projects with embroidery. 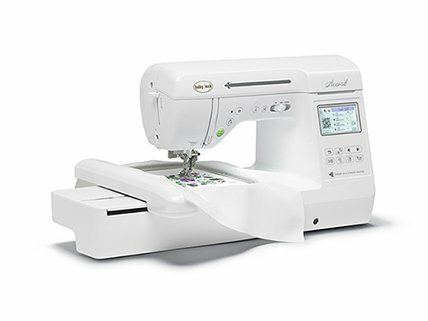 It delivers all the features you need: 141 built-in designs, 250 built-in stitches, advanced thread cutter, Quick-set bobbin and more. Move your sewing projects to the next level with Accord! The Accord 3.2” x 1.8” Color Touch LCD Screen makes it easy to select the perfect embroidery designs to compliment your creations. You’ll have fun choosing from the dozens of built-in designs and decorative stitches and viewing your selection on the digital display screen. The Accord has 250 built-in stitches and 5 alphabet styles. Embroider any of the 141 built-in designs in Accord’s library with the included 5” x 12” Multi-Position hoop. It is perfect for personalizing any of the 13 fonts too. The Accord takes all of the hassles out of sewing - including winding your bobbins! The quick-set winder holds the thread in place and stops automatically when the bobbin is full. Avoid the struggle of changing your bobbin with the quick-set feature. Simply drop your bobbin in the machine, pull your thread through the slot, and let your machine do the rest of the work.